We just finished up a three week trip to Italy with only carry-on bags. We’ve never done a trip this long with only carry-on baggage. Needless to say, we were a little worried about packing too little or too much. Here’s our Osprey Farpoint 55 Review providing the things we liked and disliked. Friends who were Italy experts advised us that based on our itinerary, we should expect heaps of walking and lots of stairs. With that, we wanted to avoid roller-bags. Since we’re a backpacking family, we settled on using backpacks. One drawback was the top loading nature of all of our packs. Just when you need the clean socks, they’re stuffed in the middle and you’ve got to empty half the pack to get access. 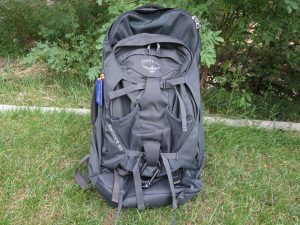 I was familiar with the “Clam-Shell” packs from by backcountry skiing setup. I did some googling and knew right away that I’d be investing in a new pack. After too many hours of research, I settled on the Osprey Farpoint 55. I picked it up from Amazon at a decent discount. 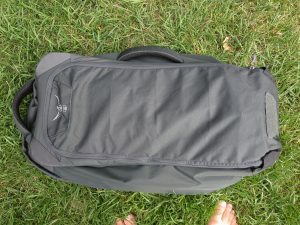 What sold me was the clamshell design, sturdy waist belt, and the removable daypack. We knew we’d be walking a lot so a decent daypack was critical. Another feature I really liked was the big zipper on the main compartment. I’ve had too many packs, bags, etc. to know that the smaller zippers just don’t hold up. There’s always that day when you want to put in a little extra and POP! there goes the zipper. So having the big zipper on the Farpoint was essential. When it first arrived, I thought huh….. pack for 3 weeks in Italy in that????? No way. Jill and I decided to give it a trial run and pack what we thought we’d need. I was amazed when it was only 3/4 full and wasn’t heavy at all. I also really liked that all the shoulder straps and waist belt could be zipped away for airplane stowage. It keeps the pack looking neat and tidy as to not draw attention from the flight attendants. Even when fully loaded, it easily fit in the overhead bins on all our flights. When all the straps are zipped away, the Farpoint 55 looks a regular carry-on. 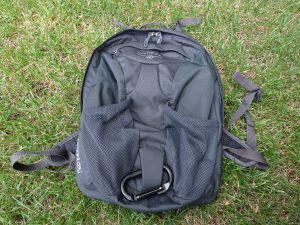 The daypack has a nice padded and zippered section for a laptop or tablet. For this trip, I left the laptop home and used a tablet. It was nice to have a dedicated spot in the pack that was protected. The daypack also has an additional zippered compartment that’s large enough to store a folder or papers. We used it to hold the papers for pre-purchased train tickets, museum tickets, and the “Skip the Line” passes for the big sites. After three weeks using this pack exclusively, I was really impressed. I see why it get’s so many great reviews online. To me, It’s obvious that Osprey took a backpack approach to luggage instead of just sewing on shoulder straps to a suitcase. The design and thought put into this pack really made a difference for our trip. After playing with the pack at home for several weeks, Jill decided to get one too. She’s just as happy as I am. The only problem was that the kids wanted one too but they’re still growing too much. Maybe in a few years we’ll get them the latest version.